Find romance between the sea and sky with Valentine’s dining cruises from Hornblower. 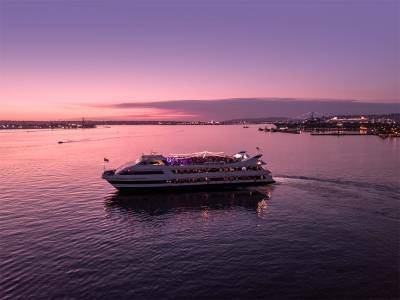 You’ll enjoy spectacular bay views with famous San Diego landmarks, delectable food to choose from with our special Valentine’s menus, and music for dancing. Indulge your sweetheart with a Romance Dinner Cruise or Cupid’s VIP Dinner Cruise on Valentine’s Day or wine and dine them with a Valentine’s Weekend Dinner Cruise Friday through Sunday or a VIP Cupid’s Dinner Cruise on Friday and Saturday. Cruises Depart from Pier 1, Hornblower Landing, 1800 N. Harbor Dr.